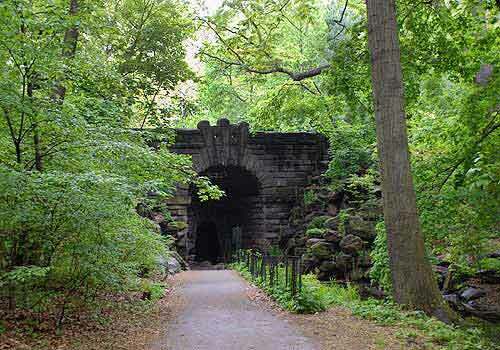 Glen Span is one of two rustic arches that form the boundaries of the Ravine, the stream valley of the North Woods. Glen Span arches over the stream, called the Loch, at its south end, with Huddlestone Arch at its north end. Both stone structures are sunken into the Park's landscape. A steep cascade falls over a rocky incline from the Pool, the water body to its west. Designed by Calvert Vaux and Jacob Wrey Mould, Glen Span was built in 1865. It originally featured wooden trestles, rock pier supports, and a wooden railing. The arch was reconstructed about 20 years later, with its wooden portions replaced with rustic light-gray gneiss rock. The arch is decorated with geometrically shaped stones and small hollowed grottos embedded in its underpass. The structure carries the West Drive above while a narrow footpath runs under it along the water.